If you’re busy Christmas shopping, don’t forget that today, Friday 14th December is the last day to snap up Early Bird discount tickets for BLOODSTOCK next Summer! 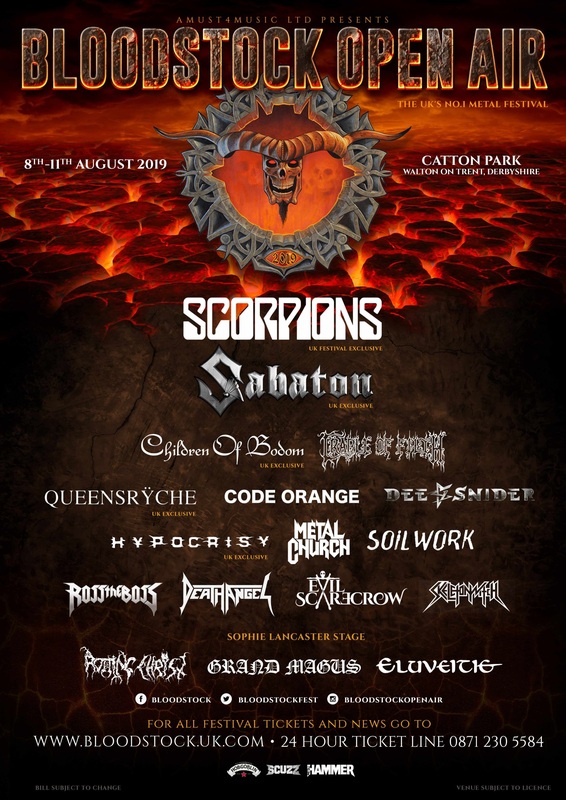 Just £125 (+ fees) for four days of metal fun, so pick up yours today at the ticket store to save a few quid while you can – http://bloodstock.seetickets.com. On Sunday 16th December, the final allocation of VIP tickets including Deluxe packages (Luxpads, Bellepads, Podpads etc) will go on sale, as well as a limited number of VIP upgrades. For full details click to http://www.bloodstock.uk.com/pages/vip-camping. Standard weekend tickets will then be available at their normal price, of £145 (+ fees). BLOODSTOCK’s very popular deposit scheme also launches on Thursday 20th December, where you can spread the cost of your standard weekend ticket over 5 more affordable instalments! Your first payment of just £36 (initial instalment of £29, plus £7 booking fee) is due at sign up – which you can do at any time between 20th Dec and 28th Feb – then four further instalments of £29 will debit your bank account on 3rd April, 1st May, 3rd June, and 2nd July respectively. Please note, VIP tickets are not available on the deposit scheme. Have you visited BLOODSTOCK’s Facebook page recently? Don’t miss BLOODSTOCK’s daily Christmas competitions, giving away all manner of cool prizes, every day through December 25th. Head over to https://www.facebook.com/bloodstock to enter the latest giveaway. Each competition only lasts that day, so visit often! You can also watch the Facebook Live Q&A that festival directors Adam & Vicky did last weekend, answering all your questions and giving away a Gojira guitar to one lucky winner! Grab your mates and come join the fun next August with Friday night headliner, SABATON, Sunday’s bill toppers SCORPIONS, together with ANTHRAX, DIMMU BORGIR, TESSERACT, THY ART IS MURDER, CHILDREN OF BODOM, CODE ORANGE, SOILWORK, CRADLE OF FILTH, METAL CHURCH, DEATH ANGEL, DEE SNIDER, QUEENSRYCHE, ELUVEITIE, EVIL SCARECROW, ROSS THE BOSS, GRAND MAGUS, ROTTING CHRIST and HYPOCRISY on the Catton Park stages. Stay tuned for even more bands to be announced in the New Year! Check out the new 2019 video trailer here – https://youtu.be/UPaaie4-HZw.